The girl you see knitting while waiting for a plane? That would be me this week, in three different airports in four days. A Marled Hat in progress (The Plucky Knitter Scholar marled with Bello Worsted) and my ongoing monster Drachenfels, which seems to go on forever. You seem to be the only one besides me and we’re not in the same airports. I didn’t see anyone (besides myself) knitting on my latest trip which involved 3 planes and airports in both directions. What are they doing? 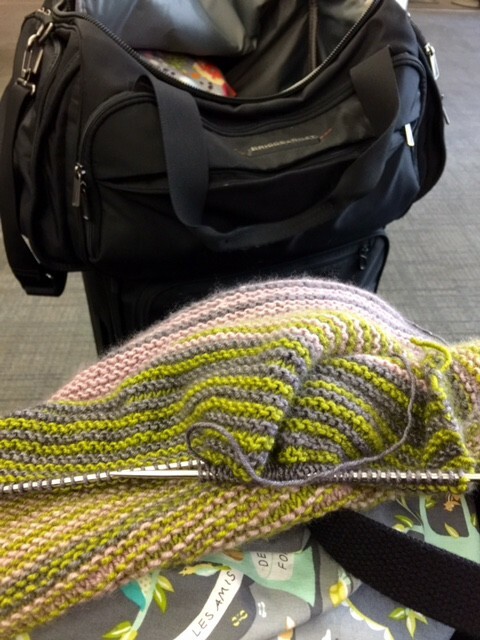 It doesnt happen all the time, but Ive had a number of trips where Ive had a nice conversation with other knitters (sometimes we recognize each others knitting from Ravelry) in airports or seen other knitters on planes. But, on one remarkable flight, I was sitting three across and all three of us pulled out our knitting. Best.Flight.Ever!